The era of the amusing and terrifying “raspberry-colored jackets” – the trademark clothes of new Russian businessmen in the beginning of the 90‘s- has fallen into the oblivion. A new business dress-code has finally appeared in Russia. Russian businessmen and politicians know now how to dress. They were helped quite a bit in this by the Kotwani brothers, who based their The Imperial Tailoring Co. elite clothing company in Moscow more than 25 years ago. The story of the brothers’ appearance in Moscow is truly unbelievable. It is so incredible that it deserves its own Bollywood, Hollywood, or Mosfilm movie. The first to arrive to the Russian capital was Sammy, the elder brother in the Kotwani family, in 1990. At the time Sammy was on business in Belgium. There he made suits, particularly for employees of KPMG, one of the largest business consulting companies in the world. Sammy himself did not make the suits. The operation worked like this: Sammy arrived to a country for three months with suitcases packed with fabric for suits, which he showed to clients. They selected the fabric, Sammy made all the measurements, and then he sent them to Hong Kong. It was there that their high-quality men’s suit manufacturing office was located, where Indian tailors worked. It should be noted that Indian tailors in Hong Kong are traditionally in large supply. This was easier said than done. First the Indian needed to receive his Russian visa, which turned out to be something that was far from simple. At the Russian Consulate in Brussels, where Sammy went to get his visa, they told him “You are an Indian, why do you want to get a Russian visa in Belgium? Head back to your country, to Delhi, and request a Russian visa at the Russian consulate there.” However, Sammy’s wish to make his way to the enigmatic country was so strong, that he decided to go down a… different road. He made the acquaintance of the Russian consul and made him an amazing suit. The latter thankfully helped Sammy get his business visa to Russia for an entire year. Sammy’s joy could not be contained. At least, at that moment his joy outweighed his worry. And he had his worries. The Indian was warned about the mafia, which worked in almost every corner of the country, as well as about the cunning and beautiful Russian women, who all worked for the KGB… Whatever the matter, Sammy was a brave person. By the second day of his visit to Moscow he decisively set off to the Moskva casino with his suitcases, packed with various expensive fabrics. Where else in those days of nascent Russian capitalism, could one go in search of wealthy clients. After all, practically all business people gathered in Moscow casinos, be they Russian or, as most business people at the time were, foreign. As an example, the general director of the Moskva casino was Vietnamese, and the manager of the gaming business was Scottish. Nonetheless, three years later, in 1993, his brothers, Andy and Jimmy, also tailors, joined him in Moscow. It should be said that the Kotwani brother do not belong to a dynasty of Indian tailors. The only relatives of theirs who were tailers was their uncle, who taught them the very same mastery in the art that they have been demonstrating in Russia for almost 30 years. Interestingly, 85% of their clients at the time they started their business in Moscow were foreigners, and 15% were Russian. Currently, however, that percentage has changed to 95% Russian and 5% foreigners. The Kotwani brothers offer their clients in the region of 10 thousand varieties of high-quality English and Italian cloth for suit-making, and a similar number of varieties of English, Italian, Indian, and Egyptian cloth for shirts. Nowadays their company’s offices are located in different cities around Russia. Moreover, their company has its own workshop. It should be no surprise, then, that Sammy Kotwani heads the Indian Business Alliance, an association of Indian companies working in Russia. 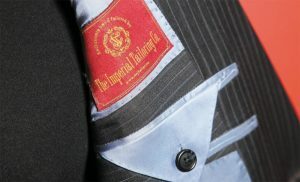 However, The Imperial Tailoring Co. sells more than just suits and shirts, but services as well. Once every half year the company offers its clients free dry cleaning and, if the client lost or gained weight, they refit the suit. Yes, over their almost 30 years of being in Moscow the Kotwani brothers have seen not only have the business dress-code has changed, but also how Moscow itself has changed. “I watched Moscow being born,” says Sammy Kotwani, who is now a citizen of the Russian Federation. Soon his brothers will also have their Russian citizenship. “It is thought that after death a person either goes to heaven or to hell. My brothers and I are already in heaven,” Andy says about life in Russia, smiling.